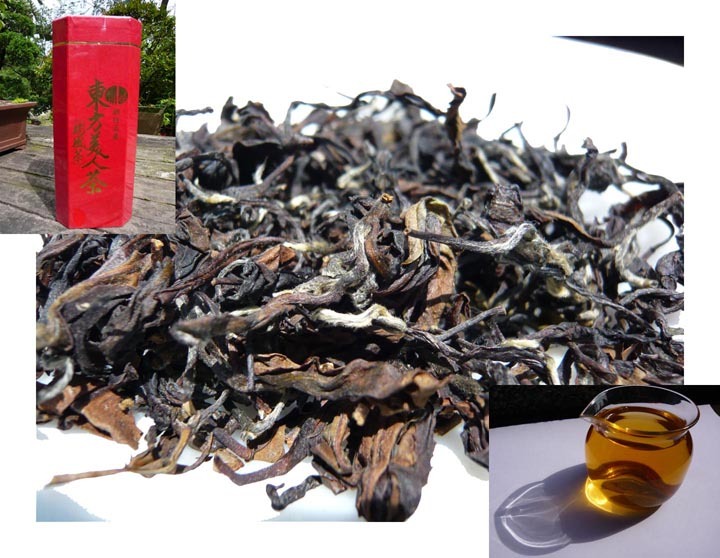 Oriental Beauty is a particularly special tea variety from Taiwan being offered at Cloudwalker. At a certain time of year, bees will nibble slightly at the tea leaves and this will cause the leaf to transform slightly into the classic oriental beauty. This tea is only from Taiwan and only from specific central Taiwanese counties. As this tea bursts forth from tea-spout to pitcher, one is immediately struck by it’s luminescence and viscosity. It is a nectarian, mouth-watering, mouth-tingling experience. It is smooth and acts quickly to engulf the palate. This oriental beauty contains superior honey qualities and an added buoyant ‘hui gan’ or returning sweetness on the throat. Ambrosial. This tea comes by its name honourably, and to purchase it you can be sure you will more completely understand its name. The American Tea Masters Association held Tea Extravaganza 2009 at the Drake Hotel in San Diego, CA and named this one of the top 5 teas (of 14 top shelf teas) on the menu! New stock has just arrived! Formosa Oolong teas and I go way back – in fact, the very first Oolong I ever tasted was a Formosa and I fell completely in love with it. Since then, I’ve been introduced to many different Oolongs, and some that I might even enjoy a little more than Formosa Oolongs – but, Formosa will always hold a very special and dear place in my heart. For that reason I was very excited to try Oriental Beauty Formosa Oolong from Cloudwalker Teas. And Cloudwalker Teas did not let me down! This is truly a delightful Oolong experience. The aroma of the dry leaves is sweet and honey-esque. This aroma translates to the brewed liquor, it’s a little softer, but, nonetheless very inviting. The flavor is sublime! It is smooth and rich and sweet. Pleasantly sweet – like golden honey! The mouthfeel also reminds me a bit of honey – not sticky like honey, but there is a very pleasing thickness to it that reminds me of honey. There is absolutely no bitterness to this tea. It is absolutely divine! It has only the slightest astringency to it. THIS is the flavor that I fell in love with all those years ago! While Formosa Oolong teas do make very enjoyable iced teas – for the fullest flavor and enjoyment of this tea, you should first try it hot… I am not saying NOT to drink it iced, because I love it iced; however, I love it even more hot. It is my opinion that the best way to experience all the subtle nuances of an Oolong is hot and unsweetened, and then, once you’ve experienced them, go ahead and experiment and try it iced. This one is also quite nice with a bit of fruit – either as an addition to the tea itself or a tray of fresh fruit would be quite good as well. This one is an absolute must try for Oolong enthusiasts. It is truly a lovely Oolong tea.